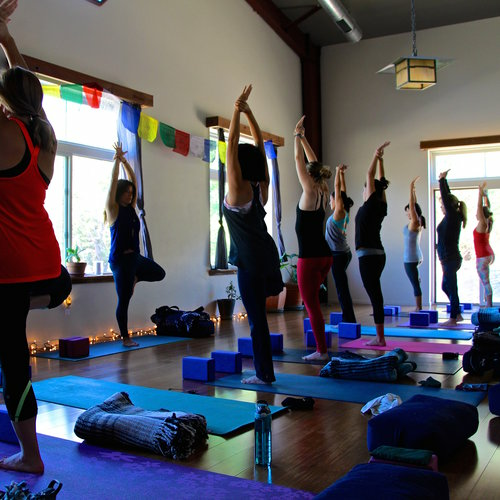 RITUAL is a three day all-inclusive women's retreat at Sagrada Wellness, offering an array of yoga classes, meditation, delicious cuisine, nature, relaxation, community, circles, and much more. Sagrada Wellness is a beautiful sanctuary in San Luis Obispo County, positioned on a quiet hilltop and surrounded by preserved land. The 45-acre mountain sanctuary is dedicated to peace and provides a backdrop for self-care, personal exploration, and a deep yoga practice. The weekend will offer a sweet balance of scheduled activities and free time for you to explore the property, soak in the pool or hot tub, read, or relax in a hammock. Everyday at Sagrada will include one to two yoga classes, along with group and individual time using ritual as a tool to create vitality and peace, while also bringing more sacredness into our lives. All levels welcome! This will be an intimate retreat (12 guests max) and space is limited. Accommodation options are updated as guests make reservations. Please note number of rooms/beds available. If you are requiring a particular room that is no longer available, feel free to make a request and we can make arrangements accordingly. SHARED ROOM | Fully booked | Communal rooms are a shared accommodation in Sagrada's spacious and sunny Mountain Vista Room with queen sized beds. You will find a large outside patio with gorgeous views, which is an ideal space for journaling, connecting with friends, or meditating on all of Sagrada's sounds. CABIN | Fully booked | The private cabin is a one minute walk from Sagrada's main living quarters. Bathrooms are located down the hill and are shared. If you are comfortable with cozy and rustic living quarters, and are looking for peace and complete privacy, then the cabin is for you! PRIVATE ROOMS | Fully booked | Private rooms have a queen size bed and open onto a spacious patio with ranch views. Bathrooms (shared) are just across the hall and are accented with Italian tiles, reclaimed barn wood from Sagrada's property, and waterfall showers. 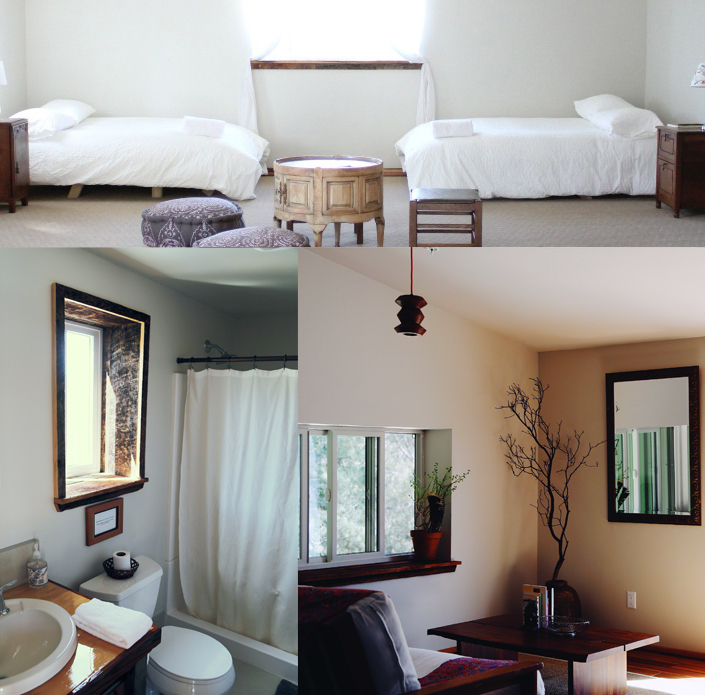 SEMI-PRIVATE LOFT | Fully booked | The semi private loft is located above the yoga studio and has two single beds. Bathrooms (shared) are just down the stairs and are accented with Italian tiles, reclaimed barn wood from Sagrada's property, and waterfall showers. All meals are included during your stay at Sagrada. The Sagrada kitchen is organic, vegetarian, and always with gluten free options. Their cuisine is rustic yet gourmet, and is served family style. Meals are prepared fresh each day with great attention to flavor and quality. There is no restrictive philosophy - enjoy a strong cup of organic coffee in the morning or wine in the evenings. Guests are invited to bring any wine you would like drink yourself or share with the group. Fresh tea with organic herbs is prepared and served in the afternoon. Sagrada cuisine has been a yogi's epicurean delight for over a decade and it is guaranteed that meal times at Sagrada will be nourishing and memorable. Still not sure? Feel free to leave inquiries or requests with me at [nataliemarieshapiro@gmail.com].